Former All Blacks captain Jack Manchester was one of New Zealand's best forwards of the 1930s, and one of their biggest at just over six feet tall and 90kg. 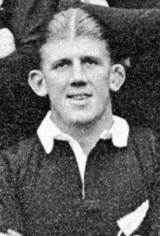 Manchester made 36 appearances for the All Blacks, nine times against international opposition, with many of those caps amassed on the three overseas tours he participated in, to Australia in 1932 and 1934 and to Britain and Canada in 1935-36. He played for and eventually captained Canterbury at domestic level, and was awarded life membership for his services to the Christchurch club. While Manchester's stature, large for that era, made line-out situations an obvious area of strength, the equally grand size of his ears earned him the affectionate nickname of "Lugger".